When the triple-digit temperatures get too hot to handle in Central California, do what the locals do — head for the hills. 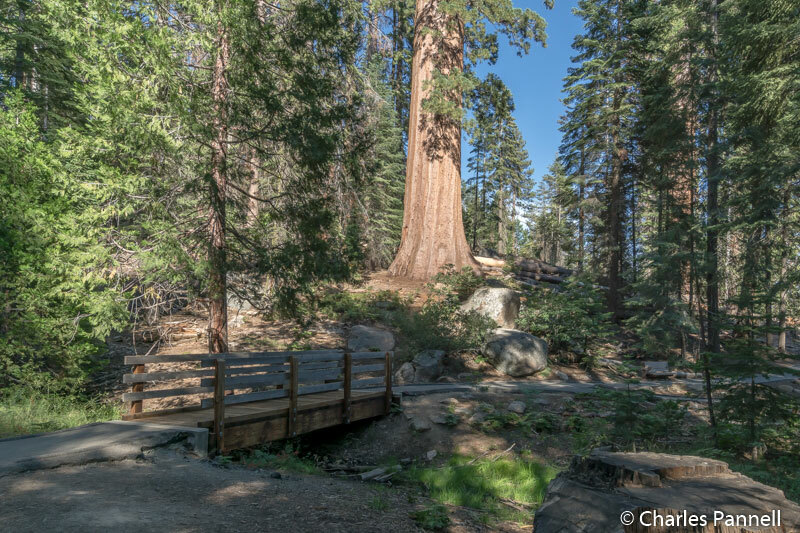 More specifically, pack a bag, grab some camping gear and hit the road to the Trail of 100 Giants (www.fs.usda.gov/recarea/sequoia/recarea/?recid=79825) — an often overlooked grove of majestic sequoias located about two hours south of Sequoia National Park. Not only is this hidden gem pleasantly bereft of the summertime crowds that descend on the popular national park, but this off-the-beaten-path find also offers a pleasant accessible trail through the grove, plus very doable, yet rustic, overnight accommodations for wheelchair-users and slow walkers. Granted it’s not the Ritz, but it’s a great opportunity to get up-close-and-personal with Mother Nature. Whoever said that getting there is half the fun, most likely took a road trip to the Trail of 100 Giants. First and foremost — turn off your GPS for the trip. It won’t do you any good and will most likely take you in the wrong direction; but more importantly, you’ll miss the scenery along the way if your eyes are glued to a screen. From Highway 99, take exit 65 A in Earlimart, which is about a half-hour south of Visalia. Continue on through town and head east on Road 56 for about 30 miles, past Ducor, Fountain Springs and California Hot Springs. When the main road makes a sharp turn to the right just past California Hot Springs, turn left on Parker Canyon Road (M 50). If you end up in Pine Flat, turn around — you’ve missed the turn. The Smokey the Bear sign on the right marks the turn to Parker Canyon Road on the way back. Continue along Parker Canyon Road for about 13 miles, but watch for livestock, as it’s open range up there. At the stop sign make a left turn on M 90 and continue along for two miles. You’ll pass the day use parking lot on the right, with access to the Trail of 100 Giants across the street. Just up the road the Redwood Meadow Campground is on the right, with another access point to the trail across the street. Congratulations, you have arrived. 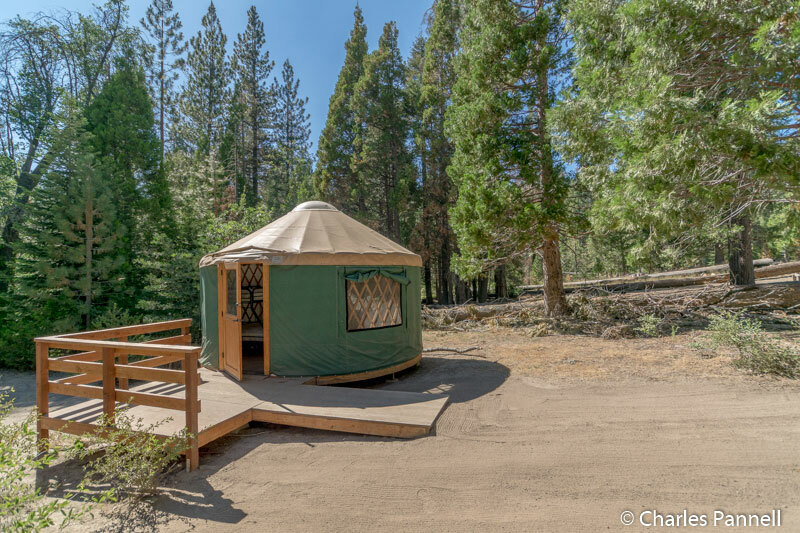 The Redwood Meadows Campground only has 12 campsites, but the good news is, six of those campsites boast accessible yurts. That said, the accommodations are pretty basic, but you just can’t beat the location. And with so few campsites, it’s never really crowded. That said, yurt 2 is the top choice, as it’s close enough to the facilities, yet it has a lot of privacy, and there’s an absolutely beautiful picnic area behind the yurt. Parking is available in a level dirt area in front of the yurt; and although the yurt is ramped, there is a one-to-two inch lip at the head of the ramp because of erosion. 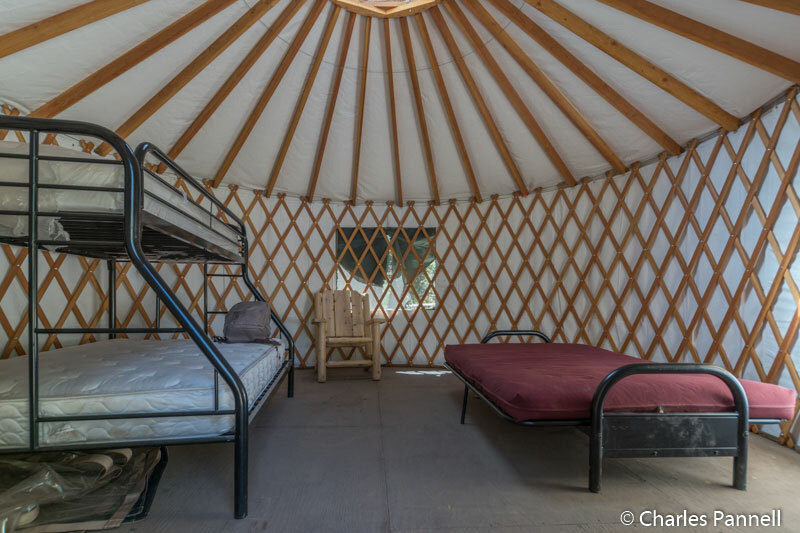 That’s also the case for the other yurts in this campground. Still, with a little help, it’s doable. Remember you’re roughing it! There’s no electricity in the yurt, but it does have a wide doorway and a level threshold. It’s furnished with a bunk bed with a 20-inch high double bed on the bottom and a twin bed on the top, and 16-inch high queen-sized bed across the room, with an access aisle between them. There’s also a large chair in the yurt, but other than that there’s no furniture. Additionally you’ll need to bring your own bedding and water. 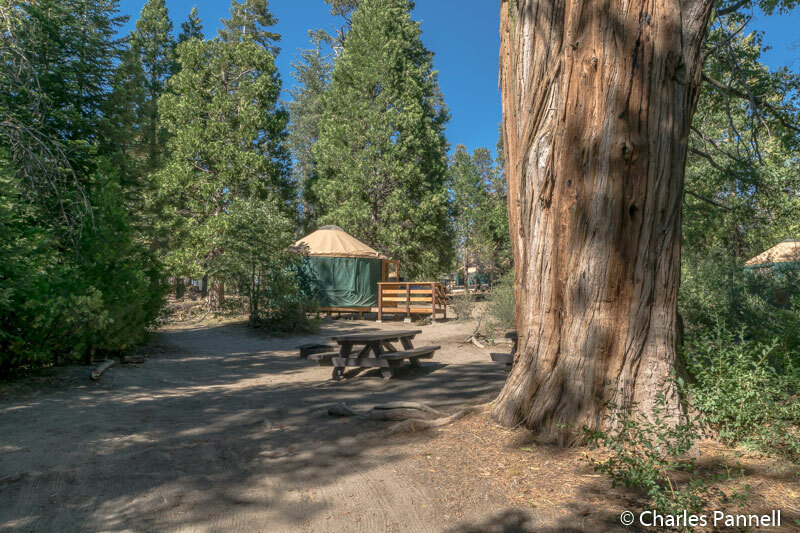 There’s a dirt pathway which leads down to the private picnic area behind the yurt, which includes several accessible tables and a fire ring. The tables are under a large sequoia, and the area overlooks the adjacent meadow. And because of the placement of the yurt, you can’t even see the picnic area from the campground road. Accessible vault toilets are located near the campground entrance (it’s best to bring your own toilet paper), with accessible parking next to them. Additionally, there’s ramp access up to the small mercantile, which offers basic supplies, snacks and sundries, and is open during the day. The yurts are available through www.reserveamerica.com, and they’re priced at a very reasonable $75 per night. And since check-in time begins at 2 p.m., there’s plenty of time to set up camp, and then wander across the street and explore the trails through the sequoia grove. It should also be noted, that this is a seasonal option, as the campground is only open from May to October. 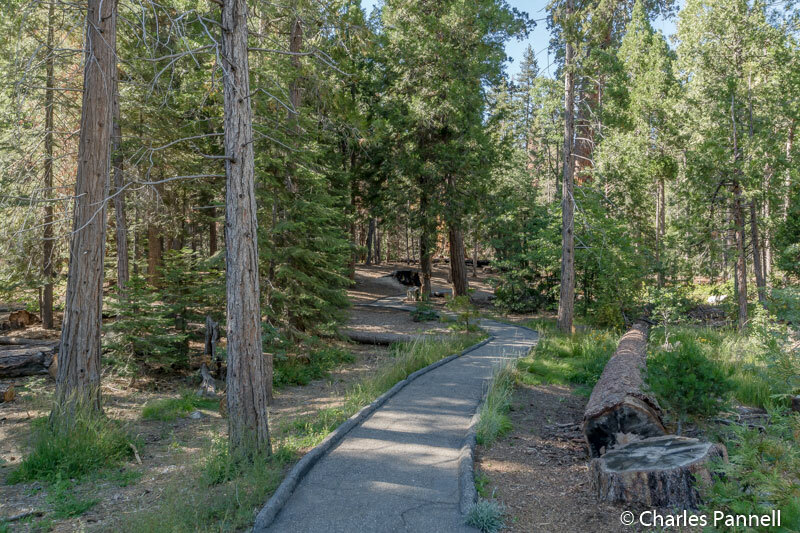 From the campground, just follow the crosswalk across the street to Long Meadow, which has two trails through the 1,500 year old sequoia grove. This secluded grove features approximately 125 giant sequoias, the largest of which is 220 feet tall and has a diameter of 20 feet. The trail forks off in two directions shortly after the trailhead; and the path to the right leads to the Trail of 100 Giants. The half-mile trail is paved and has a six percent maximum grade, but it’s best to take the loop in a clockwise direction to dodge most of the uphill sections. There are interpretive signs along the way, as well as benches to sit and rest and enjoy the forest. And one of the best parts of this trail is that you can get amazingly close to the giant trees. Once you circle back to the beginning of the loop, follow the signs to the Fallen Giants Loop to the left. At one time there was only one trail through the grove, but on September 30, 2011 two massive trees fell and blocked a portion of the existing trail. Since then an elevated boardwalk has been constructed alongside the fallen trees, which connects back to the original trail. The whole loop is just over a mile long, and it gives visitors an up-close-and-personal look at the downed trees. And although there are few a dips in the paved trail, it’s well maintained, and the bad sections are easy to dodge. It’s a nice meander through the forest, and this trail is also easy to access from the day-use parking area. Both trails make for a beautiful summertime stroll, and although the grove is a bit hard to find, it’s definitely worth the effort. Even if you can’t spend the night, pack along a picnic lunch and make a a day trip to this very accessible slice of paradise.